Your home is uniquely yours. We became one of the largest manufacturer and installer of sunrooms and solariums in the United States by always putting our customers first. No matter how big we’ve become, we never lost sight of serving our customer. 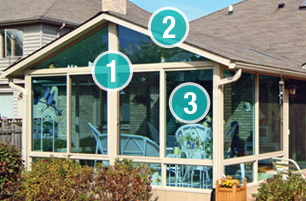 Our process is simple: your sunroom, your way, beginning to end. 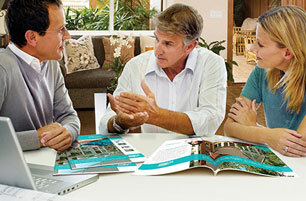 Everything starts with a no-cost, no-obligation in-home design consultation. This important meeting sets the project up for success. 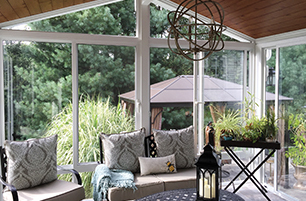 Because each sunroom is custom manufactured and custom designed to your home, there are many variables that need to be considered before your design consultant can quote you an accurate price. The in-home design consultation allows your consultant to assess the building space, ask questions to recommend the right product for you and develop a personalized plan for your project. Our experienced design consultants manage every aspect of your project to ensure it matches your vision and fits your budget. They are the key to our success. Because each sunroom is custom manufactured and custom designed to your home specifically, we do not give over-the-phone estimates. We pride ourselves on giving you the best price for your project, but before we can do that, we need to see what we are working with and ask you some important questions. 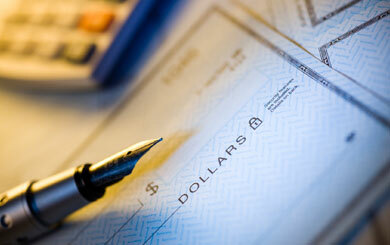 Our design consultant takes into account several factors when quoting you a price. Is a new foundation required or can the existing foundation be used? Can we build onto your existing deck? What city requirements do we need to meet? Does your city require design drawings? Does your city require a building permit? Are there any variances we need to be aware of? How do you plan to use the room? What size room is ideal for you and your family? Will you require a heating/cooling system? Based on the project’s scope, your design consultant will then recommend the right room to fit your home, lifestyle and budget. 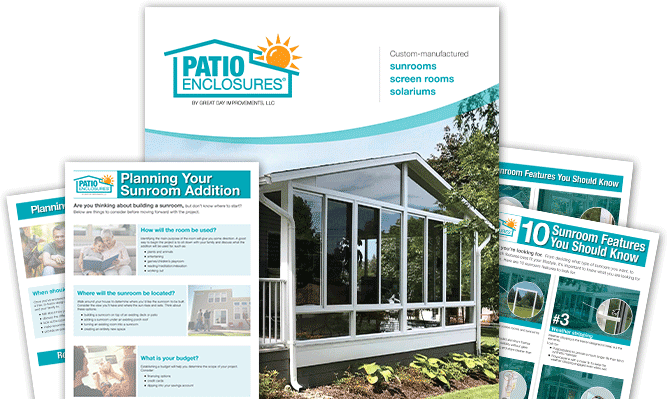 Patio Enclosures understands the financial demands of today’s economy, which is why we offer several financing options to fit your budget. 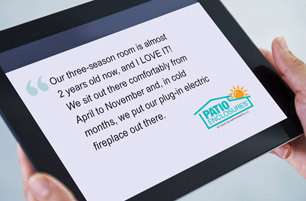 Our goal is to help make your dream of owning a sunroom, solarium or screen room a reality. Ask your Design Consultant for details or view our financing section for more information. We proudly offer American-made products that last. 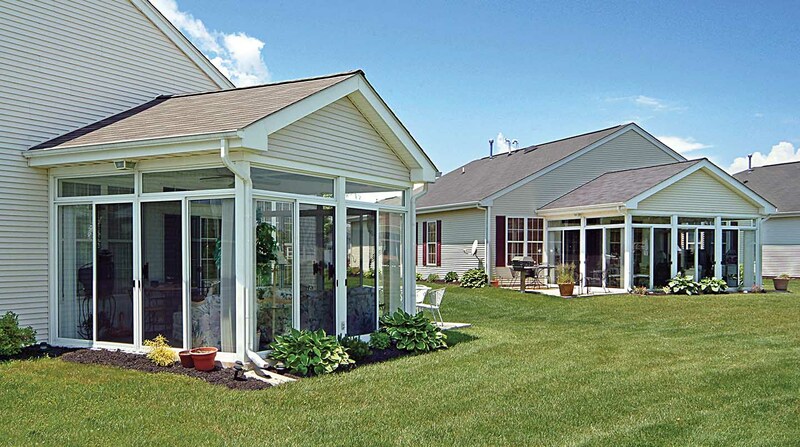 Other companies often build sunrooms with stock-size parts filling in with solid wall to fit your room and/or restricting the size of your project. Because we custom manufacture each room in our Macedonia, Ohio plant, we provide you with the perfect room for your home. Our sunrooms are up to 98% glass resulting in a sunroom of wall-to-wall and floor-to-ceiling glass – our Edge-to-Edge Advantage™. Our team of professionals will keep you informed every step of the way. Our professional installers are specialists, factory-trained and certified by Patio Enclosures to provide you with 100% quality workmanship. 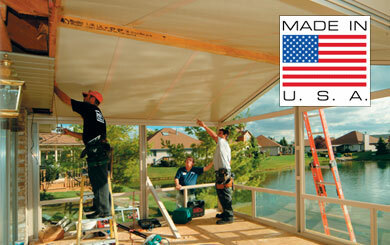 Your sunroom is installed to our rigorous standards and guidelines. 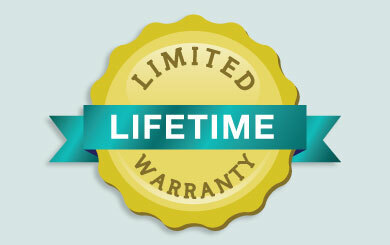 Every enclosure comes with a lifetime limited warranty covering all manufactured products including glass, roof panels, framing, seals and more for as long as you own your home. When you purchase a sunroom from the Patio Enclosures, you receive personalized service before, during and after your project is complete. If you have a service request, you can call us at any time at 800-230-8301 or you can fill out our online request service form. We also offer many replacement parts. For your convenience you can view our store here.